I had a Philly cheesesteak! The boyfriend and I decided to go to the Queen Victoria Night Market last night to celebrate my freedom (yes, did I mention that exams are finally over?). Being a person who usually spends summer overseas, I miss out on the night markets so I was really excited that I got to go this year. And I wasn’t disappointed. There was so much food. And a wide variety too. From the famous Mamak roti to buffalo wings, and even Arabian cuisine. Much to my surprise, there was a stall selling Philly cheesesteaks! I was super excited. For $12, I got a decent-sized meal, and being a person who doesn’t usually eat too much, I was satisfied. Obviously, I’ve never had a “real” cheesesteak so I had zero expectations whatsoever. Maybe that’s why it was so good. There were also your usual market snacks, i.e. those twisty potato things on a stick (I have no idea what they’re called). And there was lots of gelato! 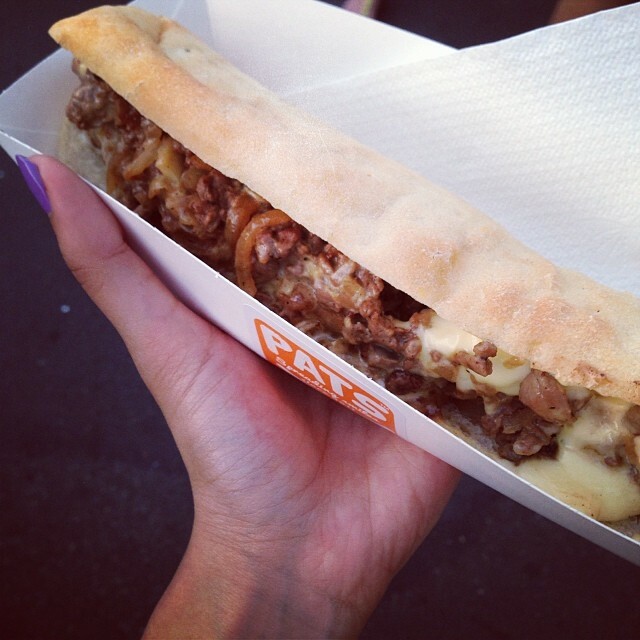 My Philly cheesesteak, what whaaat. As soon as we walked in, we saw heaps of people with sangria. I was in the mood for a celebration so I was definitely looking for some alcomahol. Mind you, I’d already had a frozen margarita while waiting for the boyfriend. We found a stall advertising $12 cocktails and sangria was $8 for a substantial amount. However, the boyfriend suggested we go to a nearby bar for sangria that was $5 per glass. Best idea! Unfortunately, I didn’t catch the name of that bar 😦 But it’s right opposite the market and kinda hard to miss. There were also other stalls selling your usual market-y trinkets, as well as buskers and bands for entertainment. I loved the atmosphere, even though it was a little hot, and it made for a nice relaxing night spent with a loved one. Would go back again. The Queen Victoria Night Market is open every Wednesday night from 5pm-10pm until 26th Feb. This entry was posted in The Places I Go. and tagged Australia, food, Melbourne, night markets, Queen Victoria Market, summer, travel. Bookmark the permalink. ← I spend too much time on YouTube.